﻿﻿﻿﻿﻿﻿Women’s waterfowl hunt opens a new world for beginning hunters. Nick Stillwell’s call breaks through the silence of the early dawn. 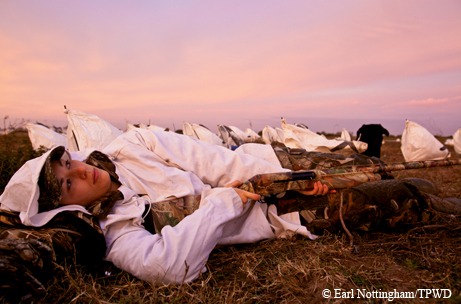 I’m in the middle of nine women, all novice hunters, lying flat on our backs in a field of white decoys. We look like geese ourselves in our white hoods and coats. We lie still and quiet, eyes searching the sky, ears primed for the sounds of a return call. Off in the distance, we hear something. Our heart rates rise. Stillwell can’t let excitement alter the cadence of his call. It takes all I have not to turn my head toward the sound. This is what we have been waiting for. ﻿Most in the group are new to hunting, especially goose hunting, as am I. We are there to test our mettle with other women who share a sense of adventure, and in a place where, despite our inexperience, we won’t feel embarrassed. 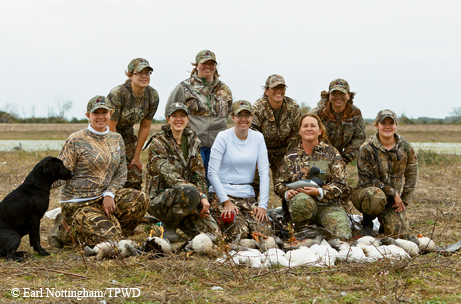 Dawn Bello, outdoor skills training specialist for the Texas Parks and Wildlife Department, organizes all-woman hunts to share the challenge of waterfowl hunting and set women up for future opportunities. ﻿﻿Awaiting instructions from the hunting guide, Lauren Laborde and her hunting partners lie still in the first light of morning as distant geese make their way to the field of decoys. Bello says she chose goose hunting because it is fun and needs little special equipment like a boat, waders or high-end gear. For help, she contacted Stillwell at Third Coast Outfitters, as well as some seasoned hunters from Delta Waterfowl, a conservation group dedicated to waterfowl and waterfowl hunting. They scouted out the best hunting spot for a large group of new hunters and provided all the gear except shotguns and shells. Teaching the women about preparation is key to this hunt, so Bello held a workshop for the participants several weeks before the hunt to answer these questions: What is it like to hunt waterfowl? What gear do I need? How do I recognize the birds in flight? How do I put out a decoy spread? What can I shoot? And even, will there be bathrooms? Bello makes sure all participants are familiar and confident with their firearms. If they haven’t shot much, she arranges for shotgun practice before the hunt. After the physical preparations, it’s time for mental preparation. Part of hunting, especially for us city girls, is thinking about what it’s going to be like to kill the animal. How will I feel? Can I really pull the trigger? One thing I know for sure: I eat meat. And I know the meat doesn’t come from the grocery store. I think about my responsibility to connect with my food source. I’ve already learned about wild edible plants. I have a vegetable garden, so I appreciate what it takes to grow food. I’ve baked bread for years, and I take pride in my ability to provide good food for my family. Hunting is the next logical step, one that’s been taken by generations before me. 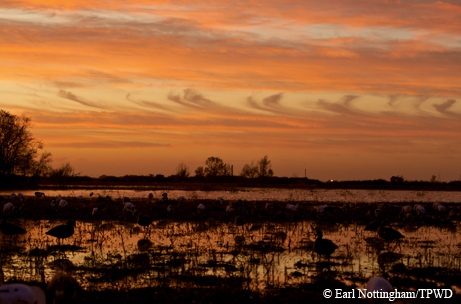 ﻿﻿﻿In preparation for the goose hunt, decoys are spread at the edge of the wetland as dawn breaks. 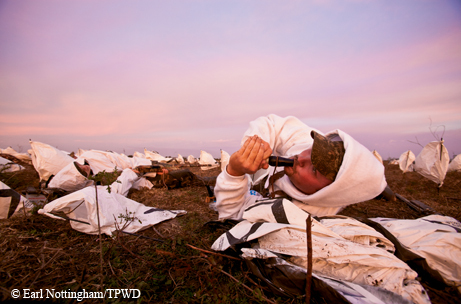 To ensure a healthy population of geese, TPWD biologists closely monitor wildlife game species. Hunting regulations are set each year based on population size, trends and availability of habitat. The agency’s goal is balanced and sustainable populations. As hunters, this group will join the ranks of conservationists who for the past 75 years have been funding wildlife conservation and habitat restoration across North America. Back in the 1930s, wildlife biologist and avid hunter Aldo Leopold called for sustainable funding to restore, conserve, manage and enhance wild birds and mammals and their habitat. Hunters agreed. In 1937, Franklin Roosevelt signed an excise tax on shooting and hunting equipment into law. Though barely out of the Depression, hunters and sporting goods manufacturers demonstrated that they had the determination to do the right thing for future generations. As part of that future generation, we can now do our part to pass it on. ﻿﻿﻿﻿﻿Hunters dress in white coats and hoods to look like geese, and the goose call is sounded. The hunt is on. The night before the hunt, we get to know one another better. We gather at a hotel near Bay City, on the coastal plains south of Houston. Hannah, 16, hunts with her family but wants to meet other female hunters. “I’m always the only girl, so I wanted to meet other girls who want to hunt,” she says. When Jackie’s husband started hunting, she realized she could hunt, too. “Dawn took me on a duck hunt, and it was fascinating watching them call in the ducks,” she says. “Unlike deer hunting, in between the birds you can talk and visit.” She gave herself this goose hunt as a birthday present. ﻿﻿﻿﻿As the command “Take ’em!” is given, hunters fire shotguns in unison. Lauren is a park ranger and wanted to try hunting. Another woman named Lauren works in the oil and gas industry and says a lot of her co-workers hunt, but it wasn’t part of her upbringing. Four a.m. comes quickly. We share a little anticipation with our breakfast, and then venture out into the darkness to caravan to the edge of the wetland. On foot, our headlamps help us navigate the occasional mud puddles dotting the field. We reach a relatively dry area next to the water’s edge, selected by our guides the day before. It is in this humble little spot where it all connects — the land, the water, the wildlife and me. Together, we set up the decoys. We remind ourselves of Bello’s lessons: Face the wind to expand the paper bodies. Flock together. Keep the noise down. Make it look right — geese are smart and will bypass something that looks or sounds wrong. We don white coats and hoods, and then camouflage the rest of our bodies. Early light is coming. 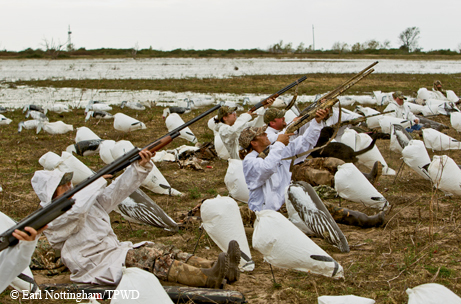 We get in place, lying safely in a line among the decoys. Guns by our side. Safety on. Don’t shoot across your neighbor. Don’t take the safety off too soon or you’ll likely shoot your toe. And we wait. We watch the morning sky brighten. We see ducks fly overhead. We imagine the next duck season, but it isn’t now. We watch the shapes in the clouds. I try to remember the last time I stopped to just watch clouds. We quietly talk to our neighbors about the trip these geese have made from their breeding spots in the Arctic and the wetlands they depend on along their migration route. We learn how challenging it is to hunt waterfowl in Texas because these are the geese that have survived a gantlet of hunters while migrating from Arctic Canada to Texas wintering grounds. Even so, more than 10,000 snow geese and white-fronted (sometimes called speckled-belly) geese are sleeping in the marshy refuge south of us. They’ll stop here to drink, and then feast in rice fields nearby. By 8:30 or 9 they return, looking for water and a little respite. Our guides start calling to the geese. Will they answer? They try a variety of calls, testing a goose version of “Hello, out there!” to see what gets a response. It’s fowl language at its best. A flock of hundreds rises in the distance. They fly in another direction, not over us. It’s an awesome spectacle. Then it happens. We hear the response. A handful of geese are calling back, coming our way. They fly high overhead, looking down on us. We can see them looking down and checking us out. We dare not move a muscle. We know their keen eyesight will spot the slightest hand movement. The geese bank away. The mature geese swing off, but two juveniles head back for another look. ﻿﻿﻿﻿The tired but happy hunters pose for a final group picture. Here comes one, a juvenile speckled-belly, close over my head. It’s time to shoot. I sit up, quickly aim, release the safety and shoot. My husband’s gun is a bit big for me, and the recoil rolls me back like a ball. I quickly sit up, silently chuckling. I don’t know if anyone saw me, but with these women, it would be OK if they did. Besides, I’ll be ready next time, I tell myself. The next one comes in, and Hannah gets it on her first try. Other geese come and go, and everyone gets a chance. Bello is lying next to me, smiling. And it’s true. I don’t know if I hit anything, but I was happy. As a group we succeeded. As for me, I met geese on their terms. I learned about their life habits. We coaxed them near and looked each other in the eye. That first one got away, and I think that’s fitting. And as I look back on the morning, I realize what a gift it all was, to be silent and still, to learn, and to enjoy the sights, sounds and smells of the morning in a way I hadn’t in years. Afterward, we shared the harvest of 20 birds. We shared phone numbers for another hunt and headed to our respective homes. On my back porch that evening, cleaning the geese was like cutting up chicken, but knowing where it came from, and earning its presence on our table, was priceless. Learning how to hunt turned out to be as natural as learning how to bake, garden or fish. It’s learning about life, survival and our connection to the natural world. It’s respect for the mysteries of nature and wildlife. It’s camaraderie with others. It’s affirmation, and it’s empowerment. It’s a first experience I’ll carry always.